- The Board of Directors has approved the expenditure for Queen Elizabeth Students to construct a main sign for our club to be placed outside the entrance. It will hopefully look similiar to the Cedar Bay entrance sign in town. - Our ANNUAL GENERAL MEETING is scheduled for Thursday, January 10, 2019 at 7:00pm in the basement conference room of the Lamplighter Motel. If you would like to keep up to date and not miss any competitions or other opportunities we recommend that you join our facebook page and click yes for notificatoins. It is a great way to stay informed and up to the minute with communications. - The weather was absolutely great for our first RIMFIRE SILHOETTE Match of the year. It was held on Sunday March 13 starting at 1:00pm. It was a 40 round match. 10 standing at 25 yds at chickens, 10 standing at 50 yds at pigs, 10 standing at 75 yds at turkeys, 10 standing at 100 yds at rams. We had a great turn out of 17 shooters and everyone commented they were looking forward to the next match the club holds. To see some pictures from it check out or Facebook page through the above link. - Congratulations we now have 2 more club members certified as Range Officer's, hopefully this can help to expand the number and type of competitions our club can hold. A big thank you to Dan Landrie who put on a great RANGE OFFICER COURSE at the Dryden Indoor Range. Having our members expand their knowldege base in our sport is always a great thing. - We had another great RIMFIRE SILHOETTE Match. It had to be moved due to poor weather from the original date. It ran the same as the last match we had. It was lots of fun stress free and extra rifles were available. - We ran an Introduction to 3GUN match, which was a blast for those able to attend. We are excited that it went so well and are looking forward to planning another. 3Gun includes the use of a rifle, shotgun, and pistol. - The month of may was a very busy time for the club with a ton of RANGE IMPROVEMENTS. It all started with the annual spring rock pick up to clear any debris that could cause dangerous ricochets. The road was also smoothed out and some of the berms were repaired including a major repair to the 200 yard bunker so we can hopefully start shooting a steel gong once approved by the Chief Firearms Officer. Also we now have a shootable target berm at the 25 yard mark. A BIG thank you goes out to Jack Roy for his heavy equippment services. - FALLING PLATES are back again with a BIG thank you going out to Bob Condo. - The sheds have also been cleaned out and a new RANGE CLOSED sign has been installed at the front. - We also now have HATS with our club logo available for you to buy at Al's Sports 84 Front St in Sioux Lookout for the low low low cost of $10 each. They come in 2 sizes Large - Crisp Trucker Style (for the extra smart) and Regular Size - Floppy. 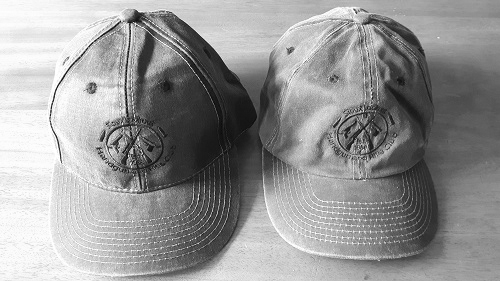 The hats are faded grey with a shiny black stiched logo. 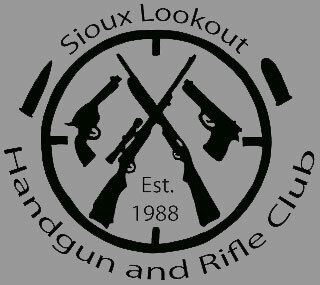 Our club logo is also registered with Signature Signs and Stichery in Sioux Lookout so you can have it printed on any of their merchandise. - We had a great Pistol Match organized and administered by our Club President. (Who coincidently won the competition). 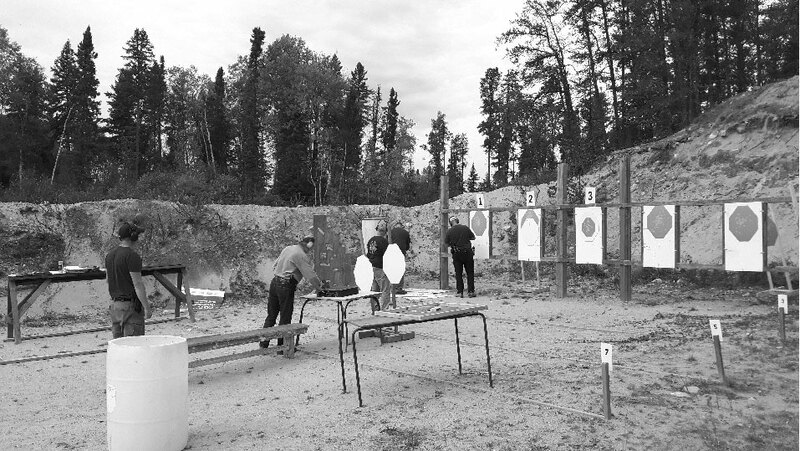 The match was scored using the IPSC handgun rules and consisted of a series of courses of fire with 10 to 20 rounds per course. All of the participants commented how they enjoyed the variety in the courses and the challenge it provided. The weather was also absolutely great.